There are always two sides to a story, and every person has their own tale to tell. Makeup artist Jake Galvez and hairstylist Buern Rodriguez, along with a unique and talented crop of professionals from the photography and fashion industry, will reveal the two faces of some of today’s most celebrated individuals in the beauty and style exhibit Face 2 Face. Photographer Paolo Pineda and stylist Shahani Gania capture the undeniable strength and courage of celebrity Katrina Halili in two portraits that can prove to be just as controversial as the actress herself. Pinoy social scene luminary Tim Yap and New York-based supermodel Brent Chua display the two-sides to their celebrated individuality in portraits by Belgian photographer Frank Hoefsmit. Internationally-acclaimed actress Alessandra de Rossi and TV show host Bianca Gonzales face each other off for the first time in two mesmerizing fashion spreads styled by RCXY Bautista; while the underground scene’s favourite muses—Jujiin Samonte and Xtina Superstar—hike the volume up several notches more, styled by Matt Gozun, all photographed by Doc Marlon Pecjo. Young Designers’ Guild President Louis Claparols and local designer Puey Quineones, editors Cheryl Tiu and Bianca Santiago, all take a break from their day jobs to be styled by young avant-garde designer Geof Gonzales, photographed by Charles Buenconsejo. Actress/model Angel Aquino and notorious heiress Tara Tambunting explore and exploit two facets of their unrivalled personalities in a shoot by Toto Labrador. Young Filipina supermodels Jasmine Maierhofer and Ann Casas, both known for their striking appearances, are paired together in two showdowns of beauty, photographed by up and comer Ash Castro. Celebrity siblings Sid Lucero and Max Eigenmann re-fashion their beautiful genes to create varied versions of themselves, photographed by Darrel Pobre. Face 2 Face is a rare mix of names and faces as it is an irreplaceable collaboration of minds and talents. Each person has a story to tell—a story that is as unique as the individual. And every story has two versions—versions that are drawn up by inspirations. 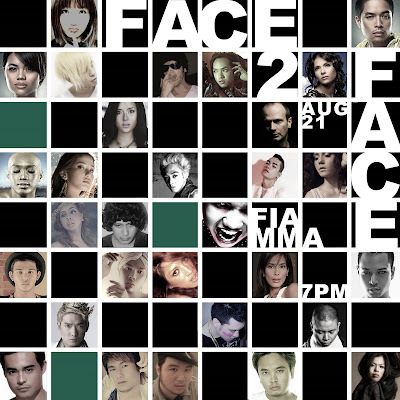 Each version promises to be as exceptional as the other, and all will be revealed in Face 2 Face, on August 21, 2009, 7PM, at Fiamma, Jupiter St, Makati City.